It's the midway point of Upfronts week, and aren't we having fun? 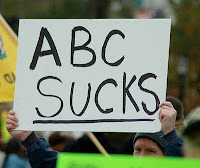 * Today we're focused on ABC, the network that brings us such Peabody-award winning programs as Wipeout and The Bachelorette. But this isn't about what's already littering the airways, it's what's coming to litter them soon. Over the course of the 2013-14 season, ABC is adding eight new programs. Luckily none of them involve "celebrity" diving competitions (looks like Splash might just be a one and done. #TeamNicole). As we all know, some of their new shows might suffer an untimely demise at some point during the upcoming TV season. And it's your task to predict which ones they will be. Take a few minutes and make your guesses in the poll below. I'll keep you posted on the results. And check back tomorrow for the next network, CBS. *I don't count The CW as your average infomercial draws better ratings than this network.